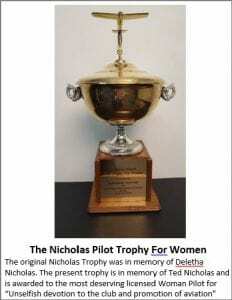 In June 1982, Betty Pettitt Nicholas was awarded the Nicholas Trophy by the Indianapolis Aero Club as the previous year’s “most deserving woman pilot of the year.” It was the second time she was chosen for the honor, and as happened on the first occasion back in 1952, unusual circumstances surrounded the award. The trophy given 30 years earlier was named in honor of Dee Nicholas, who had been the wife of Ted Nicholas, a pilot and TV executive. A year after winning the award, Betty Pettitt married Ted, a union that ended 15 years later, in 1968, when he died of a heart attack. Since that time, the Dee Nicholas Trophy had been retired, and was replaced by the Ted Nicholas Trophy. Which means Betty Pettitt Nicholas won a trophy named after her husband’s first wife, and another trophy named after him. To mark the occasion, a photograph of the honoree with seven of her good friends, all previous winners, appeared in the 99s newsletter. 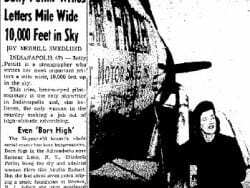 The Seymour Daily Tribune noted that the award was given “to the most deserving licensed woman pilot for her outstanding achievement and service in the field of aviation.” No doubt she was a good fit on both occasions. In September 1984, Betty arrived to plenty of friendly ribbing at the WASP reunion held in San Diego. Roughly five months shy of her 71st birthday, she had crashed the night before her planned departure from Indianapolis. Undeterred, she showed up on time in California sporting a shiner and other minor injuries. Much to the relief of her many friends, she had survived what the pilots referred to among themselves as an “I walked away from it” plane crash. She later thanked everyone through a note in the newsletter, and issued an open invitation to visit her new digs. “Many thanks to my concerned WASP friends after my aircraft accident…. Got the stitches out over my eye in Carmel [an Indianapolis suburb] and am now fully recovered. Have sold the airplane and hope to have another—or access to another — in the spring. 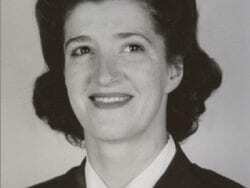 Three months later, approaching her 81st birthday, Betty took over the position of WASP Historian, maintaining and expanding old records while documenting the recent recognition of women pilots’ critical contributions to the war effort a half-century earlier. Because of difficulties walking, she had hip-replacement surgery in January 1995, which improved her mobility. She continued attending events too numerous to recount, and at many of them, she and other WASP members received the royal treatment. A typical example occurred in August, when they were invited to Lock Haven, Pennsylvania, for the 10th Annual Sentimental Journey of the Piper Aircraft Corporation. 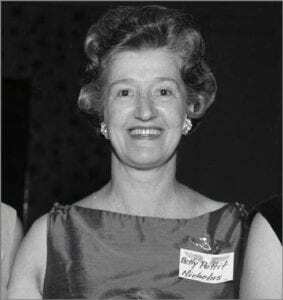 Betty noted later that “Marty Wyall and I flew over with Margaret Ringenberg in her Cherokee, the only WASP who arrived in their own plane.” Forty members were quartered at Lock Haven University and shuttled back and forth to the airfield. There was a home-cooked buffet, she said, plus a “free breakfast at The Market, a buffet at the Restless Oaks Restaurant, a tea hosted in the gazebo at the Comfort Inn; yes, it was hot, but the welcome by local people was even warmer…. “Outside our WASP tent, stocked … with many interesting items for sale [as fundraisers], were some unusual ultralights, a huge truck as a rolling Piper Museum, ancient automobiles, and a number of vendors. WASP were given rides in Stearmans [biplanes from the late 1920s], autographed an endless number of books and other memorabilia, and visited with other pilots. 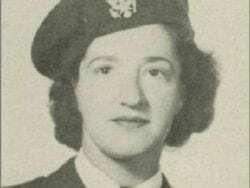 Among her other trips that year were to Oshkosh, Wisconsin (“I am impressed with their great hospitality,” she wrote), and with Madge Minton to Indiana University in Bloomington to present WASP history to Air Force/ROTC cadets there (“We were delighted a little later to be made honorary members of the unit”). Another significant event in Betty’s life occurred that year: for the third time, the Indianapolis Aero Club awarded her the Nicholas Trophy as the year’s outstanding pilot. She was 81 years old, the WASP Historian, and maintained such a high level of activity that no one was deemed more deserving. 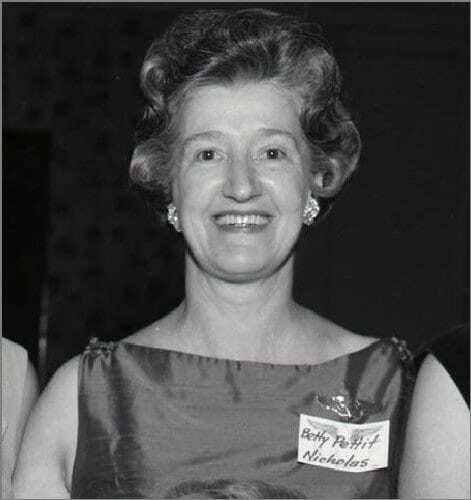 Photos: Betty Pettitt Nicholas, from WASP reunion in 1964 (newsletter); letterhead of 99s newsletter; letterhead of WASP newsletter; WASP statue, Wright-Patterson Air Force Base (AFB Museum); the Nicholas Trophy (Indianapolis Aero Club).